- C41 Colour rolls developed on site with Kodak Professional C41 QA colour chemical quality control monitoring for consistant reliable results. - We have the capacity to process 200+ C41 films per day.- True black and white film hand developed and E6 positive slide film dip and dunk developed by our trusted out-lab partners. - All films are scanned on site using the professional grade Noritsu HS-1800 . From just One Hour, depending on workload, last films for Same Day leave by 3.00pm Monday to Friday or 1pm Saturday. From just One Hour, depending on workload, last films for Same Day leave by 3.00pm Monday to Friday or 1pm Saturday. Drop off at Fotofast 24/7 afterhours dropbox also Culprit Club 5A Winn Lane, Winn St, Fortitude Valley. We print on Kodak & Epson Professional photo paper, from 3.5x5" to 24x36"
We develop, print and scan all brands of 120 C41 process film on site in Brisbane. This includes Ilford XP2 Black & White film that is designed to process through colour chemistry. We also develop True Black & White film, ready from just 3 week days. As of June 2018 we are again offering E6 processing. Drop off by 5pm Mondays and we'll have it back the following Monday. Developing & printing orders from 35mm, 120 and APS colour film are completed SAME DAY from just 1 hour depending on production load. True black & white the service time 3 week days. E6 5 week days. can be done at the same time of processing or afterwards. Scanning 35mm, 120 and 220 film is always cheapest to scan at time of development. 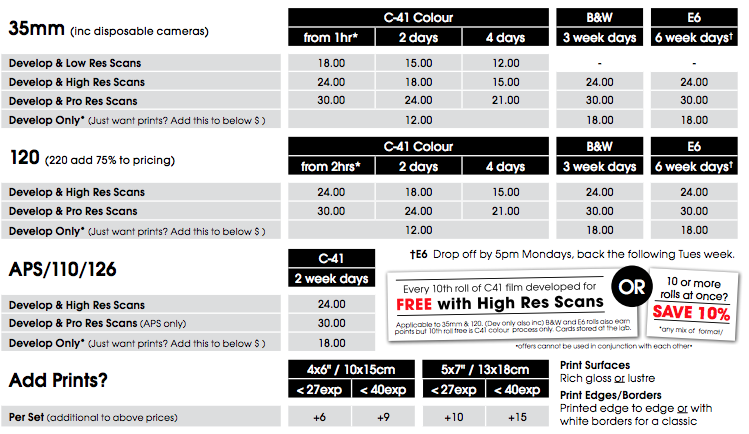 For pricing - choose our price list develop, print & scan. Film processing, Brisbane, Queensland, NSW Sydney New South Wales NSW, Melbourne, Victoria, Adelaide, South Australia SA, Tasmania Hobart TAS, Perth WA Western Australia, Darwin Northern Territory NT. Download our film price list & processing mail order form to send with your order. Enclosed full details using the form above, of what you want done, name, address, contact phone number, we will contact you as soon as we recieve your film re payment. Delivery Times Standard parcel post from three days, depending on location, Express Post next day depending on location, check Australia Post. Film processing with retro cameras Holgas & Fisheyes.